A few weeks ago, a conversation was started amongst the women in The Creative Sisterhood talking about wanting to know more about creating in-person creative women’s circles in their areas. “THIS topic IS the exact reason that I joined this sisterhood!" I get this question a lot—how can you create your own close circle of creative women who want to work with their hands or honor the moon or have deep, meaningful conversations (or all 3!)? I love discussing this, as it’s something I’ve been working on myself over the past couple of years since I moved to a new town (I talk more about it in this post). I found myself feeling isolated and, even though I was making friends and acquaintances at the gym and library and coffee shop, I wanted something deeper. I wanted to commune with women in a space of sacred creative sisterhood. So, after convincing myself I couldn’t have it, I changed my mind and decided I’d create it on my own. I opened myself up to the possibility of getting it and, within a few weeks, I was part of a circle of women that meets on the full moon each month. I talk more about the details of that group in the video below. There are so many ways to create your own creative women’s circle. And, to prove that point, I invited my friend Kelsey Mech (who is also a member of The Creative Sisterhood) to share the story of how she created her own group this year. Check it out! Start small. Just ask some women if they want to get together and make stuff together. Women want this! “Working with your hands is a ritual in itself.” It’s the gateway to the more witchy, spiritual stuff. For busy women, have them commit at least 1 month ahead of time. Doodle polls are super helpful! Leverage women’s gifts and strengths - teachers, facilitators, hosts, cooks, space holder, email organizers. Let women know it’s ok to communicate where they’re at and show up no matter what’s going on for them. It’s all ok, there is no right or wrong. Every manifestation of this concept is perfect. We are all craving a deeper connection with community. We are yearning for that feeling of the "village" being there for each other and being able to let our guard down when we are around other women. To bravely choose to gather together and have more meaningful conversations with women, we remember that we belong to community. We remember that we aren't destined to lonely for the rest of our lives. We aren't rejected by the herd. We belong. 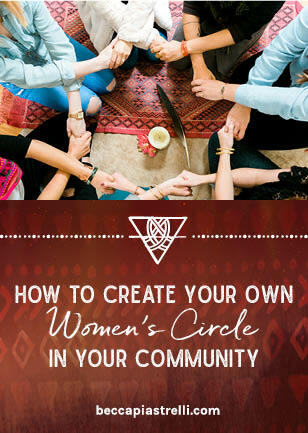 If you have started a women’s circle or sister group, I’d love to know more about what you’ve created and how it works. Let me know by leaving a comment below. This was a wonderful video to watch. It is interesting to get the various perspectives. I would call my connection with most women temperamental and this is something I’ve always wanted to improve in my life. The last time I was a part of a women’s circle was when I was between the ages of 14 and 17. It is something I miss greatly. Most of those women were much older than myself and I found some difficulty at the time relating to them. It is in retrospect that I realize the value of that experience. Yes, Tamarra! Diversity of age, perspective, work, and life path is so important in sister’s circles!